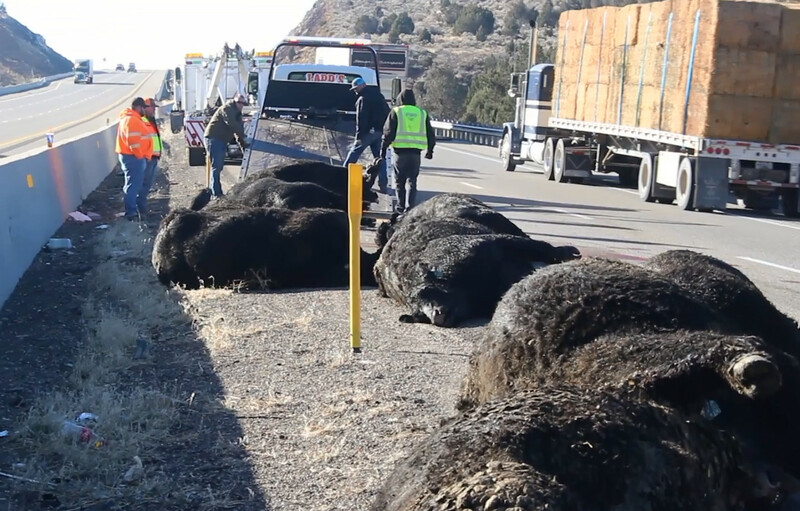 WASHINGTON COUNTY — Several cows were killed on Interstate 15 near Kanarraville early Monday morning after the semitractor-trailer they were being hauled in overturned. The trailer landed on a car in the next lane, leaving three occupants trapped inside. 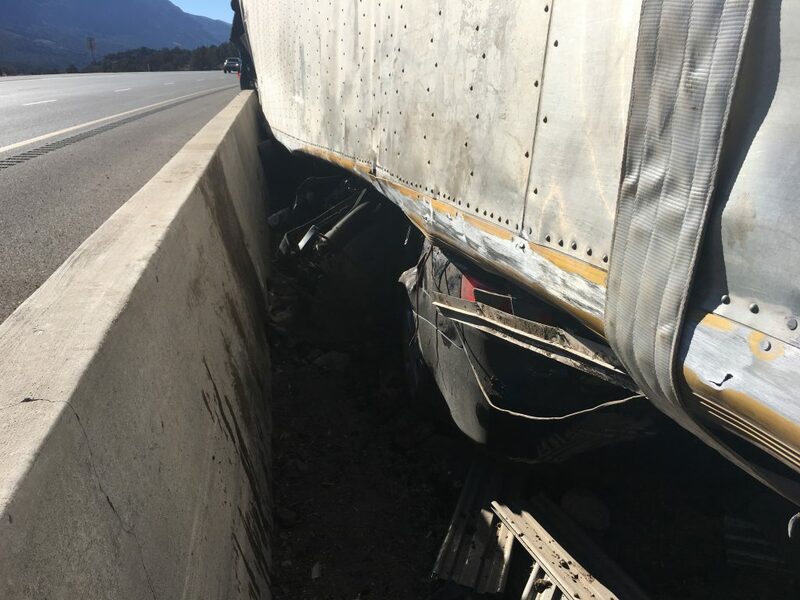 Utah Highway Patrol responded to the crash near milepost 37 on I-15 at approximately 3:30 a.m. 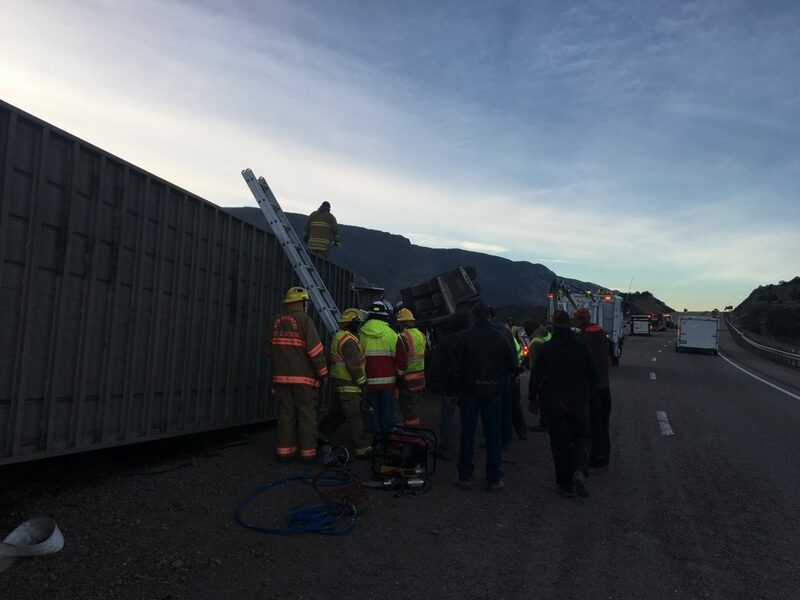 The driver of the semi was southbound in the outside lane, while a Hyundai Sonata was next to it in the inside lane, UHP Sgt. Larry Mower said. Dan Beneda, the semi driver, said he felt the trailer begin to move and thought it was either the wind or the cattle moving around. At that point, the semi rolled onto its side, smashing the Hyundai beneath it against the median concrete barrier. Emergency personnel from New Harmony Fire and Rescue arrived on scene shortly after the incident to help three men trapped inside the Hyundai. Recognizing the potential gravity of the situation, the volunteer firefighters said they offered a prayer in support of the occupants. The occupants remained stuck in the car for over an hour as crews worked to stabilize the semi to allow for safe extrication. Dispatchers from the St. George 911 Communications Center stayed on the line with the occupants until responders managed to help them out. The driver of the semi, who remained on scene to help with the cattle recovery, suffered minor scrapes and bruises. Dispatchers at the St. George 911 Communications Center worked quickly to contact local ranchers to assist in the recovery effort. One of the ranchers, Owen Albrecht, brought his own trailer and crew to help pick up the surviving cattle from the scene. Several of the cows, some estimated to weigh about 1,500 pounds, suffered broken bones and other mortal injuries. Around 10 severely injured cows either died at the scene or were put down, while the remainder of the approximately two dozen total cattle survived the incident. Firemen cut open the overturned double-deck trailer, allowing the ranchers to usher the surviving animals into another stock trailer where they were moved to be held temporarily on Albrecht’s nearby property. 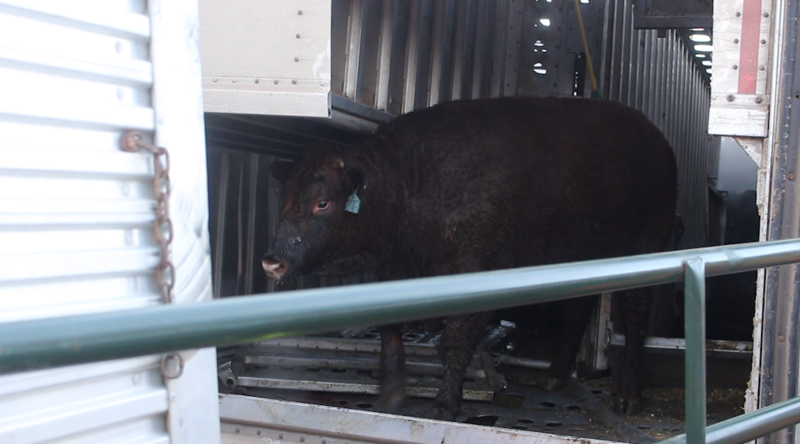 The livestock had been on the way from Cedar Livestock Auction in Cedar City to be slaughtered in California. Recognizing the viability of the meat from the animals that didn’t make it, the ranchers offered to purchase some of the carcasses, but the request was denied due to insurance regulations. 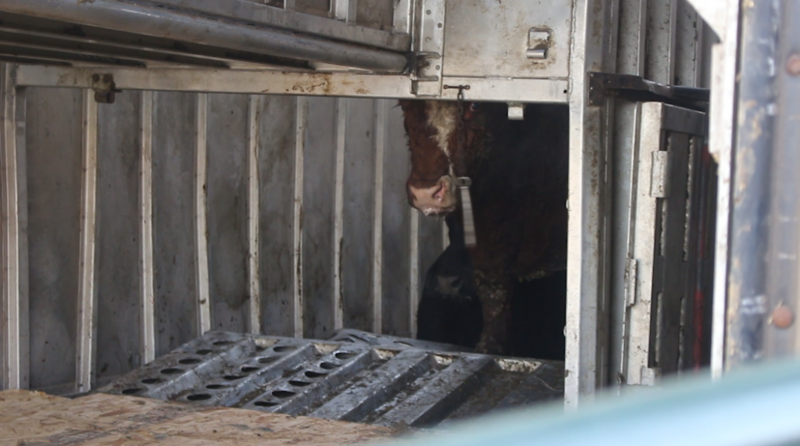 According to drivers who regularly haul livestock, Mower said, it’s normal for the animals to move around in the trailer after they’re first picked up. 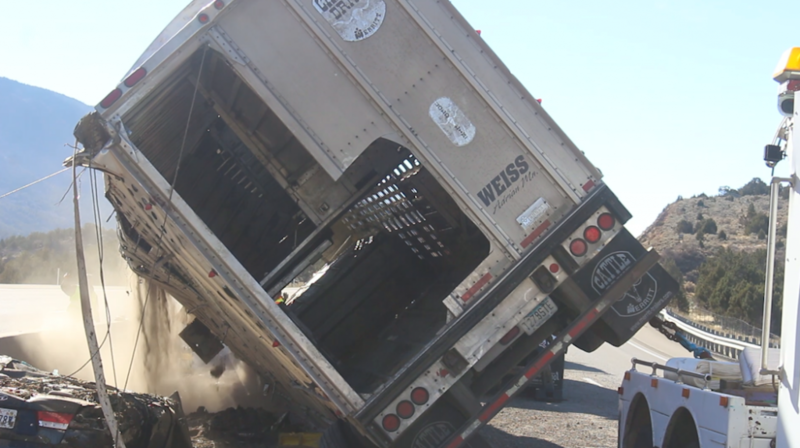 “That could have caused the weight to distribute and pull the trailer over,” Mower said. While both southbound lanes were initially closed behind the incident, the outside lane was later opened. 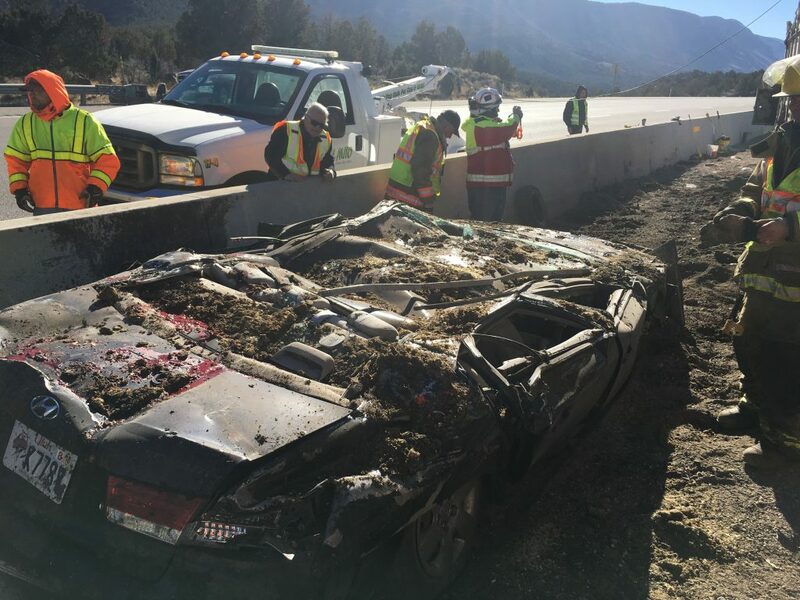 The one-lane bottleneck led to delays for motorists in the area until the semi and car were finally removed from the scene at around 1:40 p.m. 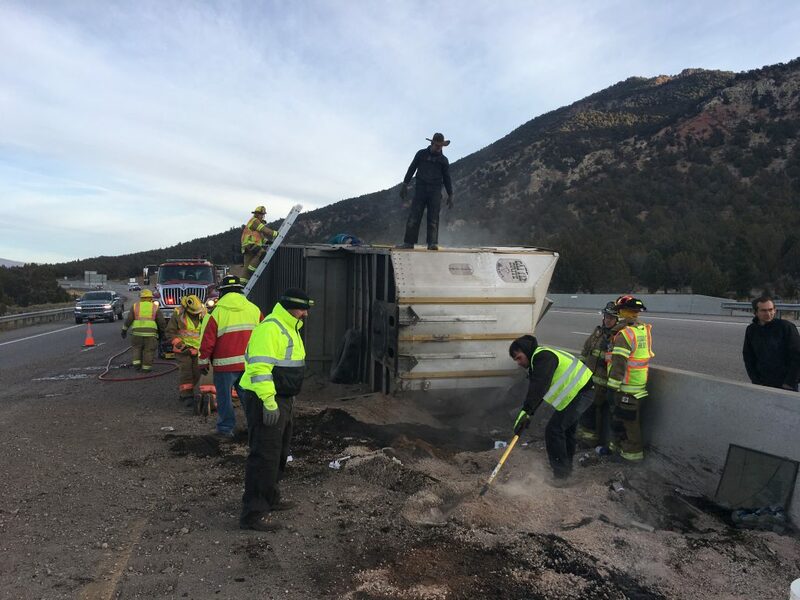 The multiagency response included personnel from Utah Highway Patrol, New Harmony Fire and Rescue, Hurricane Valley Fire and Rescue, Washington County Sheriff’s Office and Utah Department of Transportation. St. George News videographer Mike Cole reported from the scene of the crash. well well well, kinda looks more like, instead of a gust of wind, that he may have been going too fast at those curves. They are iffy at best in a car, but a loaded semi would probably get a little squirrelly. Yeah, the animals shifted because they were thrown from side to side. It’s like in the Gorge when they lose it during the curves. What a waste of livestock. They can’t buy the and make use of them because the insurance company wants to let them rot? Scenes like this should bring home to people that you don’t ride beside a big truck. If you are going to pass it, that’s fine. But pass it quickly rather than riding beside it. I’ve seen a blow out on a big truck, cause a car beside it to crash. I’ve seen a wheel come of the tandem drive axles and kill a passenger in a car. Don’t play with trucks. Give them the room that they need to maneuver. The drivers that really are stupid, are the drivers that pass a big truck, cut in on it, then do a brake check because they were delayed for a minute, and their big egos and little brains were hurt. This doesn’t look like Kannaraville and the Kannara mile post is certainly not correct. Plus if was Kannaraville wouldn’t it be Iron County instead? Was this on Black Ridge? The report indicates near Kanarraville – included to provide a familiar point of reference for those unfamiliar with actual mileposts. You are right, Miloduck, Kanarraville is a bit north and in Iron County. However, this incident occured a couple miles south in Washington County. The last exit identified in Washington County before Iron County is Exit 42 for Kanarraville and New Harmony, although as soon as one proceeds north on the off-ramp to the frontage road, they are in Iron County lickety-split. The photo with the trailer on Top of the car shows the cabin completely crushed . . .
How did the 3 guys only end up with one cut hand ? Honor1st, How did they survive? Cuz’ I’m with you, A big How comes to mind Not only from the pictures of the crushed car, you can also bet this all happened, or rather started out at around 80mph.